Shrikhand is an Indian dessert made of strained yogurt. It is one of the main desserts in Maharashtrian cuisine and Gujarati cuisine.The yogurt is tied and hung until all the water has drained off, the result being a thick and creamy yogurt. Dried and fresh fruit such as mango are also added. Other ingredients include sugar, cardamom powder, and saffron. Shrikhand is popular in western India. poori , or as a desert. It is commonly served as part of a vegetarian thali in Gujarati restaurants and it is very popular as part of wedding feasts. It is often served chilled and provides a refreshing counterpoint to hot and spicy curries. I like shrikhand but only in small quantities. It is a little too sweet for my taste, especially the store-bought ones. In spite of the fact that I’ve lived a major chunk of my life in Mumbai, I have had this Maharashtrian favorite only on a couple of occasions. Since we’re focusing on raspberries this month for A Fruit A Month, I decided to make my shrikhand using raspberries. This recipe that I came across a few days back was my inspiration. For tips on how to strain yogurt, see here or here. I used 2 coffee filters placed inside a strainer kept over a bowl (to catch the whey that drained off), to get the job done. Place the bowl in the refrigerator for 4-5 hours at least (overnight for best results). I started getting impatient after 2 hours and went ahead and started preparing the shrikhand. Mix all the ingredients together. That’s all! Chill before serving. Top with almonds and raspberries. The raspberries paired very well with the yogurt to make an easy and delicious dessert that’s healthy too. The batch of raspberries I had were a little too tart and I had to add some sugar in addition to the honey. I am going to try my hand at Amrakhand (shrikhand flavored using mango pulp) very soon. I also just wanted to mention very quickly that Easycrafts has kindly passed this onto to me. Thank you! I am going to make some strained yogurt today. Thanks for the inspiration. I can't wait to try it. I haven't had shrikand in a very long time and don't even remember now how it tastes but considering how versatile and easy this sounds i'm itching to try.... I love the colour on this. I love strained yogurt and spread it on sandwiches.. coupled with some cucumber slices sprinkled with salt and pepper - nice summery sandwich and very creamy too. What an interesting combo! 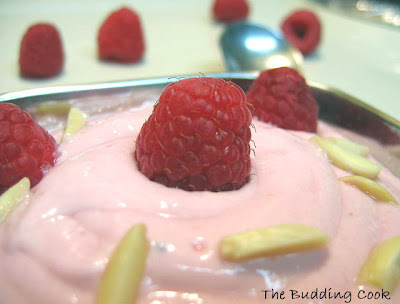 raspberry shrikhand sounds delicious! ummm...this shrikhand looks so delicious..
shrikhand is one dessert I have to try. Looks so delicious. Very nice entry for three events. Congrats on the award. Hey this is innovative must be tasting great! congrats on your award.. Thanks, TBC! Shrikhand is new to me, but I know I'd love it--thick, creamy yogurt laced with cardamom and saffron? Oooh, it's just too lovely. TBC, can trust u to come up wt the best treats!! Raspberry-crossed wt shrikhand! wow!! what a treat! You surely make our day! Enjoy the well deserved award and Congrats!! this looks delcious!! !love the presenataion..the photo is also superb!!! Dear TBC, Please do send in ur entry even its already posted, just link it to the AWED announcement and send it across to me. Looking forward for ur yummy entry. i make shrikhand all the time, as my hubby is a gujarati with a sweet tooth. this is a nice pairing. i just get the yoghurt from the grocerry store, saves me the hassel of straining it. Oh, how I adore raspberries. I'd like to try this. Though I am often cooking Indian food, I've rarely made Indian sweets. I need to explore! I am SO craving for this right now!!!! That' so unique TBC. I also like your idea of straining the yogurt using coffee filters. Very good entry. That's very interesting..have tried mango,pista and some other flavors of shrikhand but not raspberry yet. Thankyou TBC for participating !! I hope u received my email.. The shrikand looks fab!!! i have to admit, i have never had raspberry shrikhand before. Would be amazing. Yum ! rasberries pairs very nicely with yogurt so i can imagine how it tasted. one of my friend adds sour cream to the yogurt before straining to give it additional creaminess. Richa- I liked the color too. Sou've tried it with Greek yogurt then? Rajitha- oye! why did ya delete the other comment??? Siri- I did. :) Thank you! Mallugirl- Will try adding sour cream next time. :)That sounds like a good idea. I had to tell you that I made this and it is so stunning, I was licking the bowl clean. I will post later, maybe tonight (my time). Amazing how yogurt and honey can taste so heavenly. Vegeyum- thank you so much for letting me know! :). Raspberry is another great fruit for shrikhand ... Good to know I inspired you, I am always curious how my recipes work for other folks who improvise them, so I am glad I found your post!